Since 2008, Gimje-si has hosted the Gimje Moaksan Festival, famous for its cherry blossoms. During the festival, the mountain is packed with visitors from the province and urban areas to enjoy the cherry blossoms. The districts of Geumpyeong Reservoir and Cheongdo-ri gil Road nearby make for a great drive to see all the cherry blossoms, and a reason that brings visitors back again year after year. 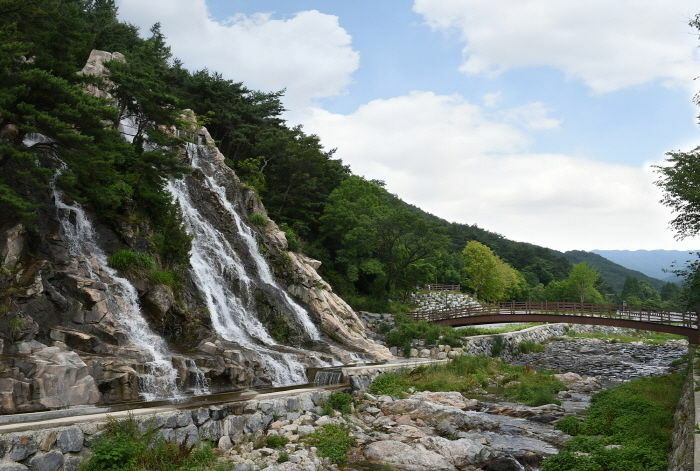 Moaksan Mountain, with its thousand years of Silla Dynasty, is located in Geumsan-myeon of Gimje. Geumsansa, Gwisinsa, Suwangsa, and Daewonsa Temples are enveloped by Moaksan Mountain. Standing tall in the eastern part, it allows you overlook the Honam plains at a glance. It is also noted for its scenic beauty as well as lots of cultural properties, including national treasures. It even topped the list of the four best natural scenic views in the Honam region. Geumsansa Temple was established in the Baekje period (599 AD) featuring over ten designated cultural properties, including Mireukjeon, the country’s only three-storey building. In spring, the temple is thronging with tourists coming to see the beautiful cherry blossom trees in full bloom along the Bangdeunggyedan stairs that enshrines Sari, a cremated remain of Buddha. Official events, performances, hands-on experiences, etc. From Central City Terminal, take an express bus bound for Gimje Geumho Express Bus Terminal. From the bus terminal, we advise taking a taxi to the venue.